Equipment: Charter equipment available in limited quantity, so pre-register early. All Participants must register. Pre-registration is encouraged. You should have also received the Official Notice of Race Flyer and Registration form as an attachment (.pdf) with this e-mail. The 2010 Winnebago Supercrossing (sponsored by A-A Exteriors.com, Jeff Knutson) & Wind Power Championships are being held September 24-26, 2010 at Roosevelt County Park, Lake Winnebago, Fond du Lac, WI. Wind Power Windsurfing & Kiting Center is across the street and is celebrating it’s 27th Year! Please see the attached flyer for more information and registration form. The weekend begins on Friday with the Lake Winnebago Supercrossing. Typically we leave from Roosevelt County Park (Wind Power) and we sail north to a destination determined at the skipper’s meeting based on conditions & forecast. With ideal conditions (west wind), it is possible to sail full length of Lake Winnebago (28 miles). This has occurred once in history of the Supercrossing. Kiters are welcome to follow but they will not be part of the race. Please contact Jeff or Kevin for more details if you are new to the Supercrossing. Saturday & Sunday are the Wind Power Championships. This is the first race of the 2011 MoWind Racing schedule. Course, Slalom and Long Distance will be run, conditions permitting. Saturday evening racers will be treated to a dinner at the Sunset Supper Club next door to the race site. Friends and spouces are welcome to join. At the dinner 2010 MoWind year end awards will be presented. After dinner and MoWind awards the annual Wind Power Bonfire sacrifice to the Wind Gods will take place. The fire usually last longer than the partiers. Don’t forget to bring your tent or trailer as there is Free camping in Wind Power’s back yard. (crawling distance from the bonfire) Sunday’s skipper’s meeting will be at 9:30 followed by racing at 10:00. Last possible start will be 2pm. Lunch, prizes and awards will be at 3 pm. We highly encourage pre-registration. If you need charter equipment (long board for non-planning conditions) please call ahead to reserve it. We will have it setup and ready for race day. We want to avoid the time needed to setup charters on race day. 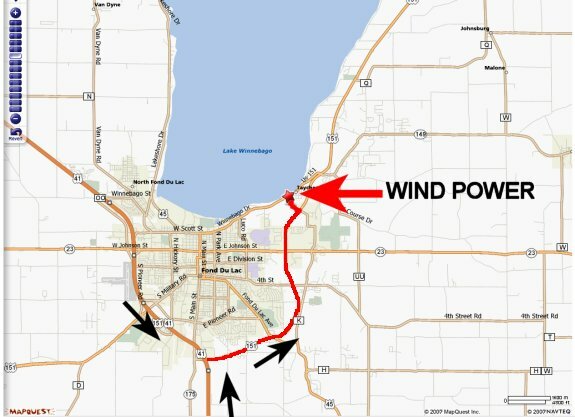 Road Construction in Fond du Lac, so you will need to take the Hwy. 151 bypass. Here is a map below. For more info, see our web site map page. See you there! !